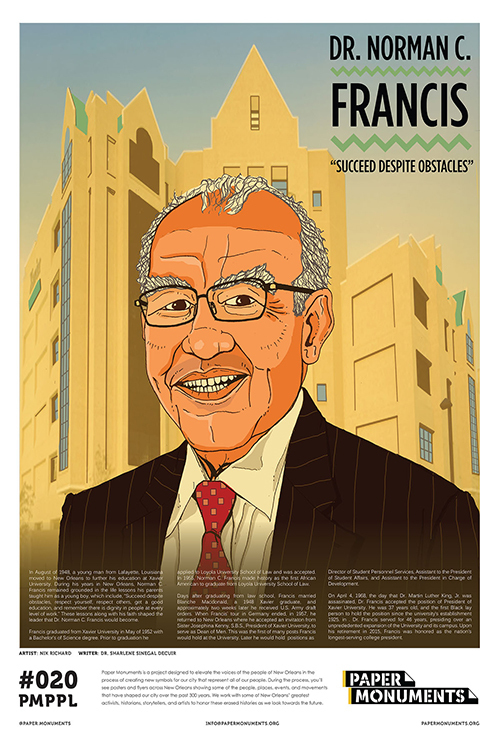 Paper Monument Poster #020: Norman C. Francis was President of Xavier University for 46 years and is honored as the nation’s longest-serving college president. In August of 1948, a young man from Lafayette, Louisiana named Norman C. Francis moved to New Orleans to further his education at Xavier University. While at Xavier he remained grounded in the life lessons his parents taught him as a young boy, which include, “succeed despite obstacles, respect yourself, respect others, get a good education, and remember there is dignity in people at every level of work.” These lessons along with his faith shaped the leader that Dr. Norman C. Francis would become. Francis graduated from Xavier University in May of 1952 with a Bachelor’s of Science Degree. Prior to graduation he applied to Loyola University School of Law and was accepted. In 1955, Norman C. Francis made history as the first African American to graduate from Loyola University School of Law. Days after graduating from law school, Francis married Blanche Macdonald, a 1948 Xavier University graduate, and approximately two weeks later he received U. S. Army draft orders. When Francis’s tour in Germany ended, in 1957, he returned to New Orleans where he accepted an invitation from Sister Josephina Kenny, S.B. S., President of Xavier University to serve as Dean of Men, the first of many posts Francis would hold at the university The other posts Francis held at Xavier comprised of several administrative positions including, Director of Student Personnel Services, Assistant to the President of Student Affairs, and Assistant to the President in charge of Development. On April 4, 1968, the day that Dr. Martin Luther King, Jr. was assassinated, Dr. Norman C. Francis, at the age of 37 accepted the position as President of Xavier University, thus becoming the first black lay person to hold the position. Dr. Francis retired as President of Xavier University in 2015 after serving 46 years and being honored as the nation’s longest serving college president. Paper Monuments is a project designed to elevate the voices of the people of New Orleans in the process of creating new symbols for our city that represent all of our people. 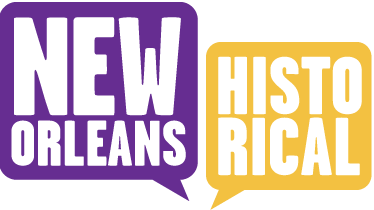 During the process, you'll see posters and flyers across New Orleans Showing some of the people, places, events, and movements that have shaped our city over the past 300 years. We reached out to some of New Orleans greatest activists, historians, storytellers, and artists to honor these erased histories as we look towards the future. ,” New Orleans Historical, accessed April 19, 2019, https://neworleanshistorical.org/items/show/1450.